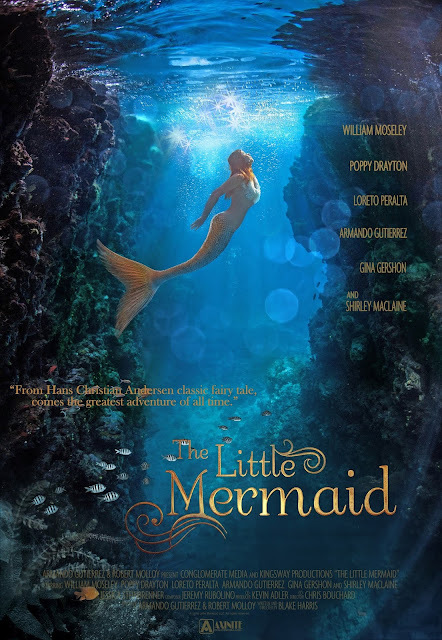 “The Little Mermaid” unfolds with an old grandmother telling her two granddaughters the story of a fascinating beautiful mermaid. William Moseley stars as a reporter who started following a story about a mermaid and a magical healing water. Together with his sick niece, they travel to a small town in Mississippi to uncover a legend. There, they go to a circus and encounter a beautiful mermaid trapped in a glass tank. They are further amazed when the mermaid appears before them as a young woman with legs. The duo soon learns of a prophecy about a little girl born on land, blessed with the heart of a mermaid. With this prophecy come to life in Elle, they are further entangled in a sinister plot of a wizard who wishes to keep the mermaid's soul and convert it to power.